The Drawout Type MCC Panel is also known as (Drawout Trolley with drawable Module, With-drawable Trolley, With-drawable MCC) is available in sizes that are standardized in multiples of 100mm with 200mm (M2) as the minimum trolley size. The sizes are based on motor feeder ratings. The trolleys are arranged vertically in a multi-tier formation. Each vertical can house up-to 9 nos. of 7.5 kw DOL starter modules. Individual motor controls up-to a max. Of 160 kw/215hp can be housed in individual standard trolleys. The maximum feeder size is restricted to size of 900mm (M9) to ensure ease of handling & proper alignment of the trolleys. The trolleys can be provided with door interlocking & pad-locking arrangements if so required as additional safety feature. 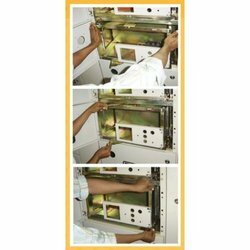 The modular design of the panel chassis allows for ease of alteration & extension if required at the site. The design ensures absolute interchangeability between the withdrawal modules of the same size. The trolley equipped with the components for the spare feeders in the MMC is thus fully interchangeable at site. Looking for Drawout Motor Control Enclosure System ?